The May derivative series ended on a robust note as the benchmark Index NIFTY50 saw a sharp surge in the second half. It ended the day gaining 121.80 points or 1.15%. In our previous note, we had mentioned about likely short covering in the second half of the trade as May had significant amount of short positions existing in the system. Thursday’s session traded much on the expect lines and it did witness a sharp surge on account of short covering. 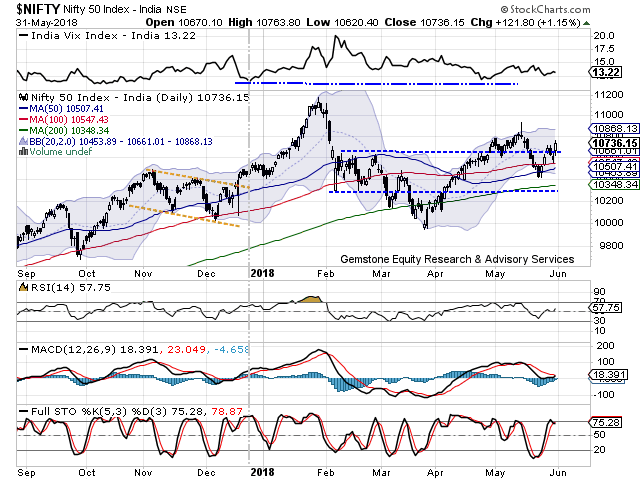 As we approach Friday, though we do expect a quiet to modestly positive start, the NIFTY has once again moved towards that situation wherein a consolidation or a mild retracement at higher levels should not surprise us. A modest up move cannot be ruled out on Friday but in the same breath, NIFTY may witness some corrective retracements from higher levels. Friday will see the levels of 10750 and 10795 will play out as immediate resistance area for the Markets. Supports come in at 10650 and 10600 zones. 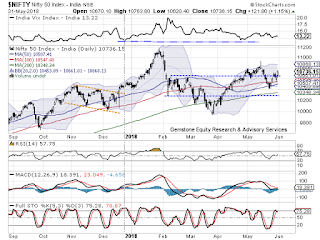 The Relative Strength Index – RSI on the Daily Chart is 57.75 and it remains neutral showing no divergence against the price. It is seen marking a higher bottom and inch higher. Though Daily MACD is still bearish, it is on verge of reporting a positive crossover. Pattern analysis reveals a interesting picture. The NIFTY has validated the support of 50-DMA at Close levels and has move past 100-DMA as well. It halted at its short term 20-DMA but in Thursday’s session, it has not only moved past its short term 20-DMA but has moved past the multiple pattern resistance zones of 10600-10650 levels. Overall, for the immediate short term, we can fairly expect the NIFTY to continue with its up move and we expect NIFTY to test its upper band of 10860-10890 zones. However, this is not likely to happen without any minor corrective retracements. Though the NIFTY shall overcome this, the zones of 10860-10890 will still remain a formidable resistance on the long term charts. We recommend making select purchases and riding the momentum. However, we also recommend maintaining high levels of vigilance at higher levels. Each up move shall protecting existing profits more important in coming days.